Pelikan Pocket-Paint-Box Set of 6 Opaque Watercolors - These neat sets start off as a semi-circular plastic box (see picture below) that opens up to reveal two layers of Pelikan opaque watercolor. 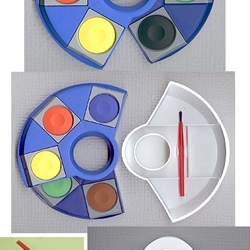 The lid flips off to be used as a paint tray and mini water cup; and has a travel brush snapped to the underside. An ingenious and inexpensive travel set- the whole set, when folded down, measures only 7"x5-1/2". The tabs of color can be removed and re-arranged.